A completely delicious and quick weeknight meal that looks like you’ve spent hours in the kitchen?. Yes please. Roasted Pineapple Chilli salsa Pork is my new favourite! This is quick and easy. The only secret here is to make sure you don’t overcook the pork. I follow the timing rules when cooking these steaks and they are always perfect. Yours will be too. Trust me. So easy, you’ll be laughing all the way to the dinner table. 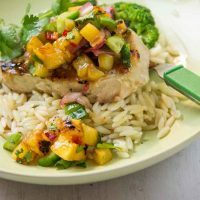 Roasted Pineapple, Chilli Salsa Pork Steaks is sort of the little sister to a full blown sweet and sour. Think of it like the better behaved healthier version that requires no cornstarch or tomato sauce. I am a lover of coriander. If you are not we can still be friends but it just means your salsa will not have the same lip smacking punch of flavour as mine. Coriander is my favourite herb. Risoni makes such a great rice substitute and covers the adage in my house that pasta goes with everything ( BTW it’s not me that thinks that). Tossing the risoni in just a little bit of the salsa dressing really helps to bring out the flavour and tie the two together. The best thing about this is that the Pineapple once grilled becomes sweet and caramelised and that’s why you don’t need to add lots of extra sugar. How do I make it without adding tomato sauce or canned pineapple juice?. Well just by making a simple light completely delicious salsa. I really wanted to cook it on the BBQ just because there was a tiny hint of summer outside but in a first for me, I ran out of gas and had to make the lot on a grill pan on the stove top. So the option is there to make this on the BBQ if you want smoky hints of flavour. Follow the 6-2-2 method to get the juiciest most delicious steak that takes only 8 minutes to cook. Maybe you can try this one pot recipe for Balsamic Pork Steaks too. Let me know how you go. OK? This recipe uses low fat Pork steaks ( boneless loin) that cook very quickly. be sure to use the 6-2-2 method to get the juiciest steak. This recipe uses Australian cup measurements. Bring a pot of salted water on and add the risoni. When nearly done add the broccoli and cook till just starting to soften. Drain and keep warm. Meantime heat a grill pan or BBQ and brush the pineapple and onion with a little oil and grill on both sides till caramelized and the onion is cooked through. Take off the heat and set aside. To make the dressing put the sugar, fish sauce, lemon and 2 tablespoons of very finely chopped (and washed!) roots and stems of the coriander into the dressing and stir very well to dissolve the sugar. Chop the pineapple into small cubes discarding the core pieces. Chop the red onion into little pieces. Add these along with the chilli and cucumber and 2 tablespoons extra chopped coriander leaves into a bowl and add all but 2 tablespoons of the dressing to the Salsa. Pour the remaining dressing into the risoni and toss to mix. Re- heat the grill pan and cook the pork. Grill the pork steaks 6 minutes on one side , turn for 2 and then rest for another 2. Serve the Pork steaks with risoni and broccoli and spoon over generous amounts of the salsa. Totally irresistible! I love that salsa made with roasted pineapples..so fresh and delicious. Thanks Angie. It’s pretty tropical…. Roasted pineapple salsa sounds soo delicious! I’m a big fan of coriander too 😀 It’s a very healthy herb, a lot of people don’t even know that. Thanks for sharing this recipe Tania. Thanks Natalie. Life wouldn’t be the same without it! What fantastic flavours in the salsa – I imagine it would pair well with so many things! Yes Kari it would go well with pretty much anything. Fish would be great! Lorraine @ Not Quite Nigella recently posted..Morticia, The Vanilla Killer Halloween Wedding Cake! Yes Bahn Mie ….I had one yesterday. I so love it! Fruit goes so well with pork and your steaks look delicious. Totally my kind of recipe – simple and fresh! Although I do have a major weakness – I always go for free-range pork whenever I can. Naturally, because it is raised happily, but also because it usually has more fat. Naughty, I know. Hi Amanda. I am with you all the way! Geez,it looks like fabulous but it is easy to prepare. Delicious! Hi Brian. Thank you. I am glad you like it! Great! I’m finding it, and now I see. Roasted Pineapple Chilli salsa Pork is all thing I expect. Thanks for your recipe. I’ll cook for my family on the weekend.